NASA scientists have discovered that Mars actually is burping gas -- methane to be exact -- which could be one more sign that there's life on the Red Planet. The space agency announced Thursday that its researchers have found definitive evidence of Methane emissions into the Martian atmosphere, which could indicate that the planet is still alive, either biologically or geologically. 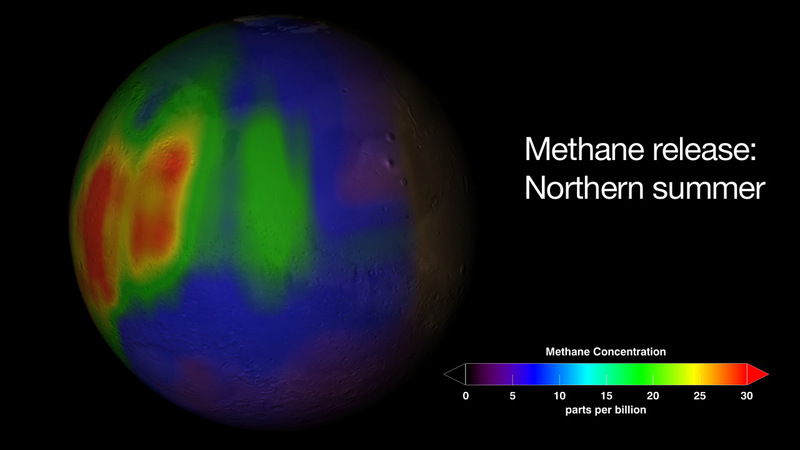 "Methane is quickly destroyed in the Martian atmosphere in a variety of ways, so our discovery of substantial plumes of methane in the northern hemisphere of Mars in 2003 indicates some ongoing process is releasing the gas," said Dr. Michael Mumma of NASA's Goddard Space Flight Center, in a written statement. "Right now, we don't have enough information to tell if biology or geology -- or both -- is producing the methane on Mars. But it does tell us that the planet is still alive, at least in a geologic sense. It's as if Mars is challenging us, saying, 'Hey, find out what this means.' "
NASA scientists have been putting significant emphasis in recent months into an effort to find evidence of life or at least life-sustaining elements on Mars. Scientists announced last summer that for thousands or even millions of years, rivers, lakes and deltas coursed across the surface of Mars. The Jet Propulsion Laboratory reported in July that its scientists have concluded that Mars was once awash in water. NASA said the findings are spurring further interest in searching not only for elements that could support life, but also for evidence of past life. Close-up photos of the planet were sent down to the NASA scientists from the Mars Reconnaissance Orbiter. While the spacecraft has been orbiting the planet, NASA's Phoenix Mars Lander was working on the surface of its northern pole for several months last year, running its own experiments. Late in June, the robotic arm on the Lander found what NASA scientists had been hoping for -- ice -- a key element in supporting life. Then soon after the ice discovery, NASA scientists announced that they'd found that the Martian soil contained minerals that are essential to supporting life. The dirt was found to be very alkaline, with a pH level of between eight and nine. It also contained magnesium, sodium, potassium and chloride. NASA reported that the minerals in Martian soil are typical of soils here on Earth. NASA scientists said Thursday that there's now more hope than ever of finding signs of life on Mars. According to NASA, methane is the main component of natural gas on Earth. It's of interest to astrobiologists because biological organisms release much of Earth's methane as they digest nutrients. But that's not the only way methane is produced. Geological processes, like the oxidation of iron, also release methane, NASA pointed out. And scientists noted that if microscopic Martian life is producing the methane that's being found in the atmosphere, the organisms most likely live far below the planet's surface, where it's still warm enough for liquid water to exist. Liquid water, as well as energy sources and a supply of carbon, are necessary for all known forms of life, according to NASA.